You don’t have to travel far into most personal finance sites before you find the obligatory compound interest post. Even I did one back in 2012 where I was so bold as to call it The Miracle of Compound Interest. TheRIT will crack on with working hard, focus on quality of life and so annually squirrel away £58,728 per annum (which is the average annual savings I’ve achieved since I’ve been on my FIRE journey, equating to a post tax Savings Rate of 82.4%) earning a real return of 4.1% per annum (my actual real annualised return thus far). I know that will include inflation adjusted savings but please give me a little slack here as it’s not important to the point I’m trying to make today so won’t bother with inflation adjusting. MrAverage will also crack on with working hard but instead focuses on standard of living. This means he can only save 5.1% of post tax earnings which has been deliberately chosen as it’s the current UK household saving ratio according to the ONS. 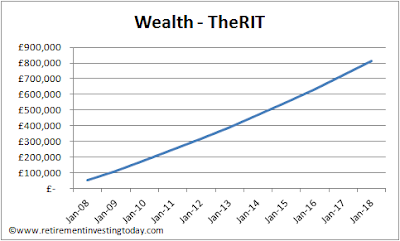 Like TheRIT, MrAverage achieves a real return of 4.1%. MissInvestingSuperstar follows in the footsteps of MrAverage but boy does she know her stuff when it comes to picking winners. So much so that every year that she invests she manages double the return of the others and so achieves a real 8.2% per annum. Ask yourself how many people actually achieve that and would you be prepared to back yourself to achieve that with severe disappointment many years hence if you don’t? Now the interesting piece. 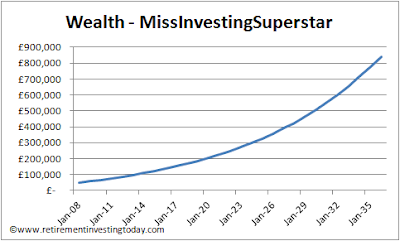 His growth in wealth has been achieved through savings of only 22% and investment return of 78%. 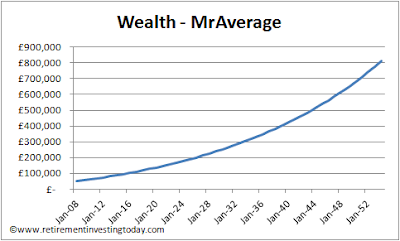 Compound Interest has done the heavy lifting allowing MrAverage to focus on consumption. I’d nearly call that a Miracle and you can see the exponential growth visibly on the chart. The downside of course is that in 46 years he’s an old man. Look at the chart though. There’s very little exponential growth meaning very little interest on interest. The relatively short duration has just not allowed the snowball effect to kick in. It also plays out in the numbers where savings has contributed 77% of wealth growth with investment return a relatively minor 23%. This is consistent with what I’ve seen personally on my own real world journey. In her case you can really see the snowball effect with 87% of wealth growth coming from investment return. The interesting thing is that 28 years is still a very long time and far from 10 years. So back to the question I posed in the total of this post - Where’s the snowball? If you’re looking to build wealth to FIRE over a very short timescale I’d bank on it not happening. Instead you’re going to need to figure out how to save and quickly. Then at least if we do only get ‘average market returns’ you’re still going to achieve your goals. great post. And i find it a little depressing. In order to get decent compound interest (as at 28 year old) i would have to have maybe 30 years with a reasonable starting sum to allow interest to do the heavy lifting. but with asset prices and rents so high, its unlikely that this will be possible over that time scale. so what you say is even more true, obviously try your best saving, but the reality (as i see it) is it wont be later in life (due to the current economic situation) that you can make decent savings. at which point its far too late to let compound do any serious lifting. so yes, hard saving is the true way forward. like it or lump it. yeah. Not looking great with the high asset prices. Turn 28 in a week. I have saved up a 34% deposit (60k) a house but that still leaves at least 115 grand worth of debt (and interest). I have STEM degree. Thats for a house big enough for children in a less 'stabby' area. so i will be left servicing the debt for a large number of years. Which then means for the last 15-20 years of my working life i will have to save extremely hard. With no real heavy lifting from compounding interest. coupled with the patchy employment landscape. Its a hard decision. work is hard. but long commuting is really hard. If i want a family i cant stay with parents forever. But i would also very much like to retire at a reasonable age, providing the stresses of the modern work place dont kill me long before that. And i save very hard, and i am very lean with my life choices. But at the moment thats the future. I dont enjoy 'things' and im perfectly happy with a humble life. But a reasonable home shouldn't be that large a thing to ask. For me never retire seems to be the best bet. Just hope something works out over the next 62 years (retire age 90). Maybe i will get lucky and stress will kill me long before that! I feel for you, and as someone two decades older than you and in FIRE, I recognise how much more fortunate I've been to have been young at a time when house prices in particular were more reasonable. So I think the situation is more positive than you may feel it is right now. I dont see real term pay rises for another 5 years, only loosing out to the real cost of living. Both myself and my partner have pushed for pay rises, thankfully my partner has recently been successful. My timing (asking for a raise on Friday, with redundancies announced on Monday) was not ideal. And also shows that asking for raises is not always a risk free activity. This further highlights the less stable working life moving forwards (even for experienced engineers). I do feel that whatever the inevitable punitive debt burden home ownership entails these days, that with sensible borrowing in reasonable salary multiples it should be okay. And providing i shun virtually all spending (god forbid my spending actually contribute to the economy!) i may be able to weather the inevitable jobless periods, and maybe pay the mortgage down in a reasonable time period. It wont be fun, and quality of life will be poor. But you have to make the best of it. As you pointed out promotions etc, may need to clearing the mortgage faster, but i dont agree with additional education, as this is now very common and has lost its edge. MBA's are no longer golden tickets. I find now that there is no forced retirement at 60 or 65, a lot of that blessed generation love to stay on (reducing output drastically) for the sake of a nicer car, or some fancier cruises. And the job opportunities are starting to be limited. I generally go with a permanent portfolio approach to investing, which is a great way to approach it. But regardless on my education on investing, its a bit useless when i'm a totally captive audience to damaging housing prices. It will have to be on the back-burner for another 10-15 years at least. I agree with your observations. What's more, there's another factor that people aiming for FIRE should consider: volatility. Whatever the mean annual return a prospective early retiree expects on his or her capital, it's just that - the mean. There can be considerable variance around it, particularly for the highest-return (and hence highest-risk) strategies. While a bad year or two can be cancelled out by periods of outperformance in the long run, over a shorter time period this may not be possible. Consider, for instance, the plight of a person close to FIRE in 2007/8, heavily invested in income-generating blue chips such as banks. Or, in an earlier timeframe, someone who backed dotcoms in the late 1990s. It may have taken them half a decade or more to restore the value of their savings. Conversely, for someone at the beginning of their accumulation phase, market downturns are a blessing, enabling them to acquire holdings at knock-down prices. This leads me to believe that a high savings rate combined with a highly diversified investment strategy that starts out by focusing on high-risk, high-growth assets then shifts toward lower risk as the intended retirement date nears, is probably the optimum approach. Thanks for the interesting post RIT. 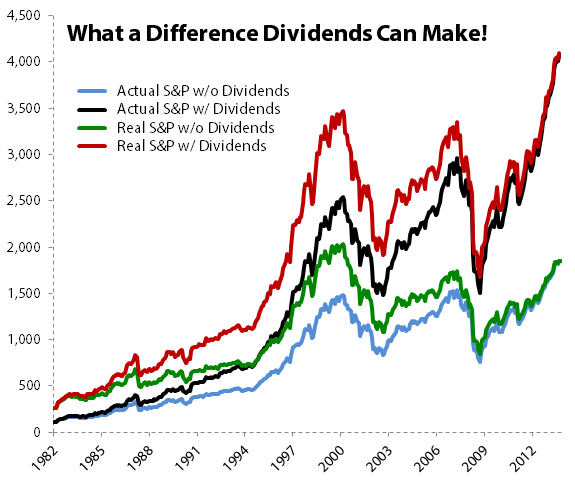 It's worth observing that somebody retiring and electing to live off the dividend stream would see a similar profile to the TheRIT, with very little benefit from compounding. Motley Fool have a useful chart that highlights this, and the impacts of inflation, pretty well. You won't inspire people to save if just base your examples based on your own high income. You'd be better off quoting what Mr Average could achieve if he earned 20% more (with overtime, or taking the job with the foreign travel) and saved the extra. That's the kind of 'working hard' people understand, rather than getting that magic job in sales, IT or finance which pays so well. It's just maths so scale as required. That said and hopefully without going to far off topic I wouldn't encourage people to limit their beliefs to +20%. - You don't need a magic job in sales, IT or finance to make good money. I don't give my profession away on this blog but I have previously declared that my secret weapon was nothing more than a decent STEM degree. - I continually see people around me who could earn a 'lot' more money but either choose not to (which is admirable) or don't know how. - I've written numerous posts covering my methods over the years and they don't require super intelligence. They do however require other sacrifices and I have no problem with readers not choosing them but readers shouldn't shouldn't say can't. They should only be saying I choose not to. Of course there is probably some luck in there also and not everyone will make it but what I do know is that if you set yourself up to 'fail' then you will 'fail'. If you set yourself up to 'win' you might 'win'. Yes, I'd say the "miracle" of compound interest is that it enables somebody to save a fairly modest amount of money and retire *at around normal retirement age* pretty well-off. Most people don't intuitively understand how saving say £300 a month could possibly enable them to do that. Which is why the likes of me bang on about it. A lot of people, even readers on this blog, really do challenge the earnings piece. I'm on the other side of it and I metaphorically shout in frustration every time they do as I'm nothing special but at the same time have proven it's possible. You could walk by me in the street today and I 100% guarantee no reader would think of me as anything but a 44 year old grey man but yet I have done it (which is very different to simply writing about it). Don't say can't. Look at what you can do and then choose not to as each requirement is of course not for everyone. I did similar to you, saved all salary and bonus, maximised pension contribution tax relief etc. Compound Interest was a minor contributor to my wealth and should not be relied upon as the driver of wealth creation, I am not in financial services, just an engineer. Looking back it was only possible with a supportive partner, living off her modest salary. Some poor souls are saddled with spendaholics and never get off the starting block. There is a lot to be said for setting your own priorities - rather than leaving things to chance . But you must be honest with yourself about the priorities - there are hard choices to be made . It is all very well looking at graphs and charts of wealth creation - but it says nothing about the pain , worry and sacrifices that might go along with each scenario. I think most people find it difficult to get their priorities clear - and if you are a couple - these priorities need to be set jointly - to ensure buy in etc. Also - seeing an independent adviser , writing wills , and discussing with suitable friends or relatives that you trust and respect may all help clarify. You will need an open mind - as the best option to crank up your earnings might be to go and work in Saudi Arabia for a few years - and have a tax free salary - but are you prepared to do that - honestly - are you ? Of course - RIT's 3 scenarios with the £50 K are totally artificial - and have serious limitations in the grand scale of things. Life is unpredictable and uncertain - look at our GE in 2015 , Referendum result and now election of Pres.Elect Trump - so there are no certainties . So - any plan you may come up with may be de-railed - or frankly fail . I think for most people the dedication and determination that RIT has shown to achieve FIRE in his life is only for a tiny minority . And - RIT still doesn't seem to know what he wants to do with his life now that he feels he has achieved FIRE. I hope RIT sorts out his life and his future now that he feels he is in a position to do so . But I think anyone can( and should ) sort out their own current live's to give them some peace of mind, fun and happiness NOW . Maybe it is better to travel - enjoy the journey wherever it takes you - than to arrive . I think a fourth example would be interesting. 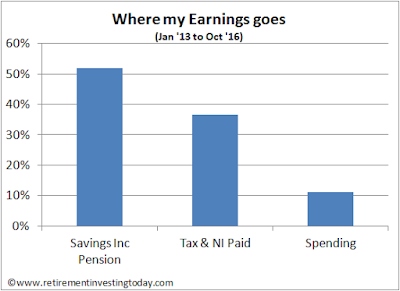 High-ish earnings (moving from graduate average up to a top 10% earner for several years but not top 1%), high saving (building up quickly to 30% of take home pay), and good investment returns (6% real after inflation returns). I think it would take less than thirty years to reach your target, and growth would contribute more than savings (maybe 60% from growth and 40% from savings). Also some savings can (or previously could) be got from employers and the government, e.g. 61% of my pension is from compound growth over many years, 12% from employer contributions, 11% from contract out contributions and basic rate tax relief, and only 16% from my employee contributions. Great post - and a call to reality for many of us. Striving for a portfolio of well diversified, low cost tracker funds is really important, and yes compound interest will help over a lifetime. But the real, hard, grinding slog is that if you want FIRE within 10-20 years you have to save hard. If earnings are modest then its a damned lot harder - but then the question is how much do you want the FIRE and (crucially) what are you going to do when you get it? Superb article, I hope to share this to all the people on twitter banging on about how their dividends are going to allow them to retire in three years. I would have liked to see how things panned out post retirement in the examples. Ten years certainly isn't long-enough to feel great benefits from compounding. There seem to be two groups of people aiming for FIRE - those who want to quit as soon as possible and those who don't want to be working when they are old (-ish). I quit at 50 and I certainly noticed a big snowball effect over my last 10 years. That was partly compounding, and partly the lifting of restrictions of how much could be saved into tax shelters. My savings rate went up massively once I wasn't paying tax on the savings. Sorry I've not had time to read all the comment, so excuse if this has been covered. Does that average 5.1% saving rate come after mortgage repayments for the average person? I'm wondering if that might give an unfavorable comparison because the higher saving rates are presumably only achievable through renting, but after X years, presumably Mr Average has paid off his mortgage, and has more disposable income, which he may choose to save? Am in my mid 30s and a year and a half into my savings journey. I have close to £75k spread amongst savings accts and ISAS and have been salary sacrificing my bonuses into my Hargreaves Lansdowne SIPP (£60k in cash). My goal is to continue on this path and build up a bigger emergency fund in readily available cash, while maximising my SIPP allowance. Would be good to get some advise from the clever folks on here. With the £60k in the HL SIPP, how should I allocate this? Am happy to go 100% equities, any advice given recent events (trump/brexit) is now a good time to jump in? Should I spend all 60k at once, or drip feed at 10k every quarter? Thanks Anonymous, I guess the tricky part is what trackers to invest in and do HL offer them for sale in their SIPP? HL will most likely sell what you need, they're pretty comprehensive. Note that at £60k+ their charges start looking expensive. On what trackers to invest in, reading Smarter Investing by Tim Hale, and/or Investing Demystified by Lars Kroijer should help. You could get by just reading relevant Monevator articles also..
:( you've just destroyed my hero Mr Compound Interest! Cut down in his prime by Dr Logic! What a shame! But building wealth was always going to have to be a slog - prioritising savings was always the key. Compounding is the icing on the cake! Oh man. That is indisputable. You mean we need to work hard and be frugal - now that is something you won't see on a get rich fast site. Preach it! !